Tales of Sonic Displacement is the SoCCoS project’s final catalogue. Five European organisations collaboratively designed the SoCCoS project as an exchange network in which artists, curators, researchers and non-professionals worked together on an equal basis. Together, they explored topics on the thresholds of other domains opening questions like: What can art mean or do for society? Who is the artist? What do we hear and how do we listen? What is the significance of context? As a residency and research network SoCCoS (Sound of Culture – Culture of Sound) mainly engaged with exploratory music, sound art, and culture. This publication demonstrates what a sound art residency can mean. It does represent a wide range of activities of the project and takes three distinct perspectives: that of the artist, the organiser, and the outside observer – in this case four researchers deepening the project through related topics. 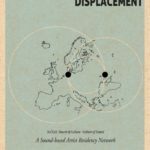 Over sixty artists and researchers, both emerging and established, participated in the several artist residencies and research projects, and the book includes an immense amount of interesting texts and reflections around sound & culture in today’s European context. Editors: Julia Eckhardt & Luís Costa – Graphic Design: Luís Costa – Redaction: Henry Andersen, Julia Eckhardt, Taïca Replansky & Rui Costa – Printing: Tipografia Beira Alta (Viseu, Portugal). Order the publication against handling costs at info@soccos.eu.